Cast your mind back to the baby-faced Villa backline of Lowton, Baker, Clark and Bennett. Any striker would have been licking their lips at the chance of ripping them apart (and frequently they did). Now look at the backline of ugly tough-guy bruisers – Hutton, Vlaar, Senderos and Cissokho – Villa put out against Stoke, you wouldn’t fancy meeting that quartet in a dark alley. Villa now have men and not boys in defence. It makes a big difference. 2. Villa are tougher around the edges too. On the edge of the pitch was the beard and shell suit of Roy Keane who never let the officials get away with any wayward decisions at the Britannia without barking something at them. Lambert and Keane getting angry in tandem was a good sight to see. Passion and fire. Much needed qualities this season. 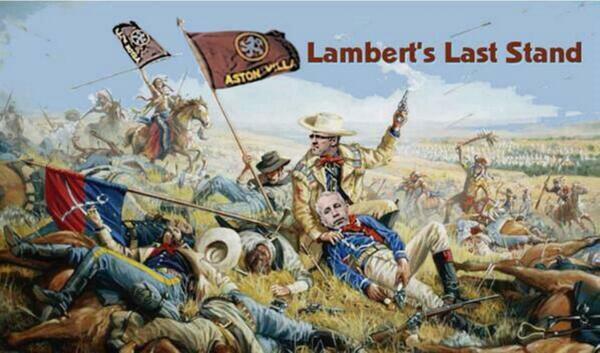 Is Keane to be the cavalry for Lambert’s last stand? Keano! Get us out of here! And on the edge of the Villa defence will soon be our new Colombian midfield-enforcer Carlos Sanchez. There’s certainly a lot more muscle about the Villa set-up this season. With a more solid set up in defence and midfield, it bodes well for the likes of Grealish, Cole and N’Zogbia to be freer to express themselves. In the case of Grealish, it was good to see Lambert give him a go in the first game. With a more solid shape to the backend of the team Lambert could be open to more endeavor in his forward selections this season. Benteke back in September would give us a puncher’s chance in the six game run against last season’s top six. Some fans have said, ‘Yeah, but we beat Arsenal on the opening day last season and then look what happened…” Arsenal should have been out of sight at half-time in that game. Villa rode their luck and hit the Gunners with three sucker punches. Against Stoke, there was an element of a control to the proceedings. Stoke were limited in their chances and Villa could have won by more. Add to the fact, Villa were also without three of their best players in Benteke, Okore and Sanchez and there is much reason to be optimistic. Even without those three in the squad, the bench also looked a lot stronger than last season too. A decent showing by the sold out Villa away section at Stoke, as per usual, but also a few days earlier a small group of Villans lead by the Brigada 1874 of L8 in the Holte End, helped save the day on the streets of London in the Football Supporters Federation (FSF) march to the Premier League office to protest for affordable football. I was there too and had also had been the only Villan on the FSF march last year. The march last year in June was blessed by glorious weather and banners from the likes of Spurs and Arsenal fans and a very strong showing by the Liverpool Supporters Union, Spirit of Shankly. This year, fans of the London clubs weren’t out in such force maybe because of the weather and it was left to Villa and Liverpool fans to provide the banner power. Without the Villa fan’s ‘Against Modern Football’ and ‘Fat Cat’ banners, the march may have been a little visually thin on the ground. Respect to the Brigada 1874 for making the drive down. With Vlaar, Senderos & Okore all currently in the squad, I’d like to see Nathan Baker loaned out to the Championship. He’s still young, get some regular game time at a lower level may help improve his confidence and decision making.